The Office of Quality Review (OQR) selects cases for Federal QR during the Disability Determination Services (DDS) case closure process and prior to effectuation of the DDS’s determinations. (1) Windfall Elimination Provision (WEP), (2) Government Pension Offset (GPO), (3) Workers’ Compensation and Public Disability Benefit and (4) Treasury Offset Program (TOP). A provision that reduces Social Security spousal and widow/widower’s benefits, if they’re based on the earnings record of a worker who spent part of his or her career in government employment not covered by Social Security. The GPO is a reduction to spousal or survivor benefits if you have a pension where you did not pay Social Security taxes. The reduction is 2/3 of your pension amount! For example, if your pension is $3,000, the SSA will subtract nearly $2,000 from any spousal or survivor benefits before you are paid. This large reduction often completely wipes out any benefit for which you are eligible. If you have a pension from ‘mixed’ earnings, the entire pension amount should not be used in calculating the 2/3 reduction! Only the amount that came from the months where you did not pay Social Security taxes should be used. Workers’ compensation is a state-mandated insurance program that provides benefits to employees who suffer job-related injuries and illnesses. The benefits are paid for by employers or paid by government agencies (e.g. Public Disability Benefits, PDB: California State Disability Insurance (SDI or CASDI)). Death benefits: Payments to your spouse, children or other dependents if you die from a job injury or illness. If you receive Social Security disability benefits, the amount receive will be offset by workers’ compensation. method 1. The Average Monthly Wage Formula: Social Security uses your average monthly wages to calculate your disability benefit amount. method 2. The High-Five Formula: Social Security uses the average monthly wages from your five highest-paid consecutive calendar years. method 3. The High-One Formula: Social Security uses the average monthly wages from the your single highest-paid calendar year during the previous five years. The High-One formula is used in the vast majority of cases, although Social Security will use whichever method is most favorable to you. method 3 by computing 1/12th of the total of wages and self-employment income for the calendar year in which the individual had the highest such wages and income during the period consisting of the calendar year in which he/she became disabled and the 5 years preceding that year. 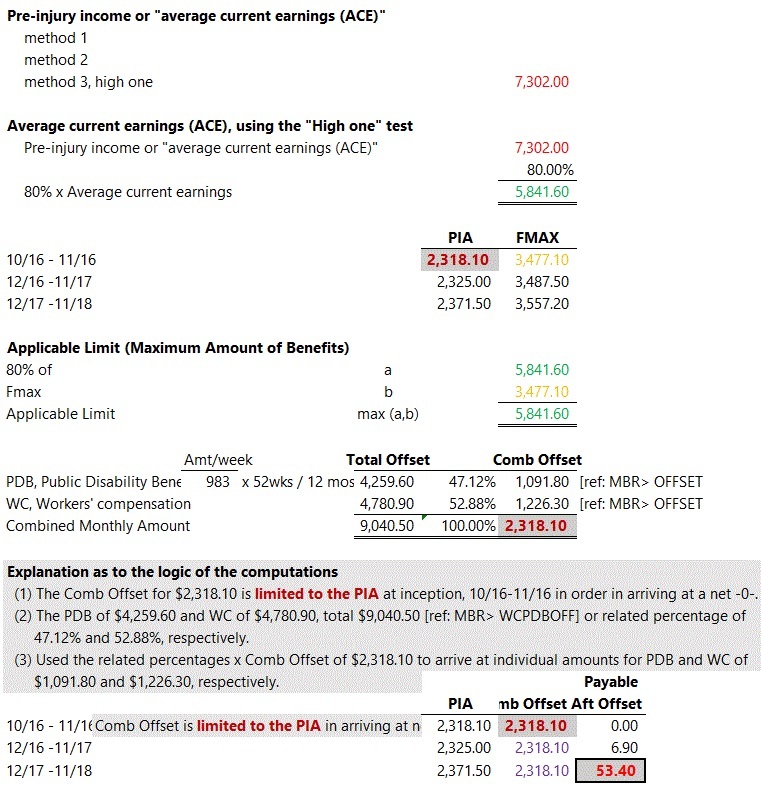 Using one of these three methods (the one which generates the highest number), the Social Security Administration calculates the individual’s ACE, reduces the ACE by 20%, and then compares the resulting amount to the sum total of the individual’s monthly workers’ compensation payment plus his/her monthly Social Security disability entitlement. Where the ACE (after reduction by 20%) is less than the sum total of the disability payments, a dollar-for-dollar offset will be applied to the overage. Reduction of SSDI. First Social Security calculates 80% of the average current earnings (or uses 100% of the total family benefit, if that is higher) to come up with the applicable limit. Then it adds the monthly SSDI benefit to the monthly worker’s compensation benefit. If the benefit total exceeds the applicable limit, Social Security will reduce SSDI until it reaches the applicable limit. What is the Treasury Offset Program (TOP)? The Treasury Offset Program (TOP) is an agency established to maintain and collect debts under applicable laws, and is administered by the Bureau of the Fiscal Service’s Debt Management Services. TOP is a centralized offset program that collects delinquent debts owed to federal and state agencies. If you owe certain governmental agencies any amount of money greater than $25, that governmental agency will submit this debt to TOP. TOP maintains the debt information in its database and informs the SSA of debts you may owe. For example, let’s say you are awarded monthly disability benefits, but it is discovered that you owe past-due taxes to the IRS. TOP will maintain that debt information, notify the SSA of the debt owed, and legally intercept some of your monthly benefits until the debt is fully satisfied. Receive a receipt for any report you submit. You are currently browsing the archives for the M, N, O category.